Obesity is a growing problem in the Western world, and many people seem to be constantly on diets, trying to lose weight. Can extra vitamins help people with weight loss, and does dieting mean always missing out on important vitamins and minerals? Can Vitamins Promote Weight Loss? A lot of vitamin enthusiasts suggest that taking extra B vitamins, including vitamin B12 (cobalamin) injections, promotes weight loss and increases energy. There doesn’t seem to be much scientific evidence of any weight loss or energy boost effect, other than in people who have an existing illness or vitamin deficiency. There is anecdotal evidence of weight loss, but this might be because people having the injections also receive advice on diet and exercise. The injections can be difficult to get hold of or expensive and can cause a range of side effects. There are plenty of B vitamins in a healthy, balanced diet that includes meat, dairy products, eggs, whole grains, and beans and pulses, and yeast and molasses are also good sources. Though calcium is not a vitamin, a number of studies have shown that increasing the intake of calcium from dairy products can improve weight loss. Can Vitamins Slow Weight Gain? A study of middle-aged people in America suggested that taking multivitamins, especially containing vitamin B6 and vitamin B12, as well as chromium, might slow weight gain in some people. By restricting the intake of carbohydrate- or protein-rich foods, very strict diets can be deficient in certain vitamins and minerals. Researchers from Stanford University in the USA looked at the women on the Atkins, Zone, LEARN (Lifestyle, Exercise, Attitudes, Relationships, Nutrition) and Ornish diets. All the diets except the Zone diet showed low levels of some vitamins, particularly E. Women on the Zone diet had reduced risks of vitamin deficiency. Alli is a drug that helps people lose weight by blocking the absorption of fats. The fat-soluble vitamins A, D and E bind to fat in the diet, and as Alli works by blocking these fats, taking it could mean that these vitamins are simply swept out of the body. To avoid any deficiencies, it may be a good idea to take a supplement containing the recommended daily dose of these vitamins a couple of hours before taking Alli. Some dieters will take very high doses of some vitamins, believing that this will increase their rate of weight loss. 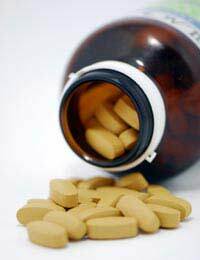 Vitamins in too high doses can be harmful (see ‘Can Vitamin Supplements Damage Your Health?’), or simply a waste of money, as some excess vitamins are simply lost out of the body through the urine. The healthiest way to lose weight is to eat a balanced diet with plenty of fruit and vegetables and good quality lean protein, with low fat dairy (or dairy substitutes) to provide a rich source of calcium. For people who are concerned that they are not getting enough vitamins and minerals, an inexpensive daily multivitamin and multimineral supplement may be helpful. Avoid high-cost supplements with excessive levels of any particular vitamin and/or mineral.